I hope you enjoyed my article. I have written about business, chess, and martial arts. Currently, I will be writing more about personal development and business success. Check out my profile to see my other articles. If you want to write articles and maybe earn money doing it, sign up as an InfoBarrel writer. Most basketball coaches and players know the importance of free throw shooting. Although there are many styles and techniques to free throw shooting, most good free throw shooters observe similar practices in their technique. In this article, I will explain three of them and how to start implementing them into your own free throw shooting practice. Both of these can be very effective, but the key is to pick one and practice putting your feet in the exact same position every single time. The idea is to remove any element of chance in your shooting technique. If you practicing putting your feet in the exact same place, you will never have to worry about adjusting for your foot placement. I prefer to keep my feet parallel because I feel it is more consistent, but there are many excellent free throw shooters who do it with the shooting foot forward. Remember, although shooting free throws is similar to shooting jump shots in a game, the difference is that you are standing still, you don't have a defender in your face, and you can take your time to set up. So pick a stance and stick with it. After you are set in your stance, develop a simple routine before you shoot the ball. For example, Steve Alford, the great Indiana University player who also played in the NBA, always had a specific routine that everyone at Indiana knew about. They would chant it while he would do it before his free throws. His career free throw percentage was 87%. Many players will dribble the ball several times. This has the benefit of relaxing you and keeping the blood flowing in your arms. Pick how many dribbles you are going to do before you shoot. Where do your eyes go when you are getting ready for the shot? Are they on the basket? Are they on the ball? Develop a consistent place to focus on. It may change. For example, some players look at the ball while they dribble, but as they raise the ball to shoot, they focus in on their target. Some players do not look at the ball and simply look at the basket while they dribble. Again, developing a routine that works for you and sticking with it is the key. The idea behind this is that you are making these parts of your free throw shooting automatic. Free throws are not like shooting in a game, where you have to make many adjustments on the fly. You can develop one way of shooting, perfect it, and then just repeat it for the rest of your career. After you've set your feet and gone through your routine, you shoot the ball and follow through. Although the ball has left your hands, it is very important to follow through properly. This gives the ball backspin, which helps keep it straight as well as giving it the best chance to go in after bouncing off the rim or off the glass. Below is a good video explaining how to follow through properly. The key is to do it the same way every time. Are you noticing a pattern here? I hope you have found these keys helpful. You may have never thought about your free throw shooting technique in as much detail as discussed in this article. However, remember the importance of free throws in basketball. Think about how many more points you could score if you shot free throws at 80% or better? What adjustments would your opponents have to make if they knew that you would most likely put up two points every time they fouled you? Take some time and develop your routine and habits. The time will be well spent. If you use these tips and they help you, let me know by writing in the comments. I wish you the best as you improve your free throw shooting! This little book helped me personally go from 64% shooting to 88% in about two months of consistent practice. 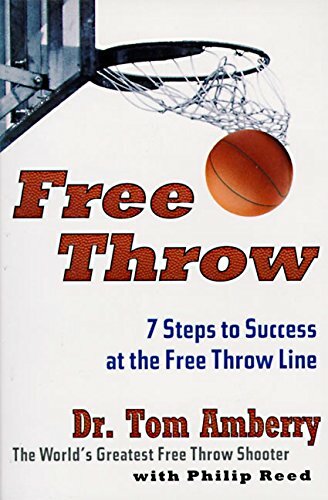 This book is very clear and concise about the steps needed to be an awesome free throw shooter. Feinstein, John Season on the Brink. Unknown: Simon & Schuster, 2011 (reprint edition).